These two octogenarians are driving across America this year to pay a visit to everyone on their Christmas card lists. Christmas "presence" in lieu of cards. 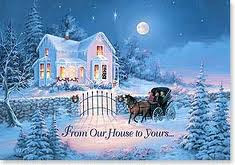 It gives a whole new meaning to the age-old Christmas card slogan "From Our House to Yours." Watch This Space for the Continuing Update of their Christmas Card Road Trip: The All-True Travels and Adventures of Nancy and Susan. Susan Phillips lives alone in a small town in California wine country. Last December, two days before Christmas, she finally dragged herself to the kitchen table to start the annual task of writing out her holiday cards. My God, she told herself, she had been sending Christmas cards to some of these people for almost 60 years. Some of them she hadn't even seen in 50 years. But what was there to do? "If you stop at this age," the straight-talking 80-year-old says with a laugh. "There's only one assumption: You're dead." Nancy Appunn and Susan Phillips in St. Petersburg, Fl. That was when Susan came up with this crazy, creative late-blooming idea: Why not drive across America and actually visit all those people on her Christmas card list? And she knew just the friend to do it with her: Nancy Appunn who, at 82, would have a Christmas card list as long as Susan's. "We get a map of the United State and we put a dot on every place where we send Christmas cards," Susan said, ringing up Nancy who also lives alone but on the other side of the country in St. Petersburg, FL. "We connect the dots and there's our itinerary. We hit the road, Thelma and Louise in their dotage out visiting all these people across America." Wouldn't that be an adventure: A Christmas Card List Road Trip, the next item on their Bucket List. Nancy was in. And while they were at it, why not keep a diary? Both of them, after all, were journalism majors. They would jot down their impressions of America and Americans and turn them into a book. Susan and Nancy, in fact, first met while getting those journalism degrees at Ohio University. Despite contrasting personalities, the two always had a lot in common. Both pledged ADPi. Both married and both had two children, a boy and a girl. After college, both worked for newspapers, Susan at the Tampa Daily Times, Nancy at the Cleveland Press. Even when life took them in separate directions, they still kept in contact -- if only through Christmas cards. Susan divorced. At 50 she went back to school and got another degree in computer science. At 57, she joined the State Department with stints in the Ivory Coast, England and China. By 65, she was retired and living in California. Nancy became the first woman copy editor ever at the Cleveland Press where she rose to the position of assistant women's editor. She moved on to the St. Petersburg Times where she again was the assistant women's editor and the golf editor. Later she founded a company with her husband to teach public speaking to corporate officials. Later she worked as a business manager for her church, retiring at 70. After the death of her husband, she began to travel extensively, often with Susan. "We tell people: Our husbands are gone. Our children are gone. Our careers are over. And then our dog dies," says Nancy. "So now we're free to go anywhere." The two friends share the same progressive politics -- if not, that would have been a "definite deal-breaker," says Nancy -- but they admit they couldn't be more different in almost every other area. Nancy praises Susan for her planning skills, calling her their trips' chief organizer. Nancy is by nature far more spontaneous. Susan calls Nancy a "people person." Susan is somewhat of a recluse. Soft-spoken and sweetly earnest, Nancy is the one that you could imagine out greeting the neighbors or strolling across the links. Susan, wonderfully wry and acerbic, would be the one you picture curled up with a glass of wine and a book, maybe on anti-fracking. "Sue's a foodie from California, and I'm from Ohio and like pot roast and mashed potatoes," says Nancy. "But it works." Neither look -- nor act, for that matter -- their age. Their Christmas Card List Tour should be a breeze compared to the their 2008 trip to the Far East. That year they followed the Silk Road from Beijing to western China, sleeping in trains and in yurts. Then they drove in a pickup truck with flames painted on the side through the Himalayas into Pakistan along the Karakoram Highway. Highway? What a joke, says Nancy. In her Christmas card letter that year, she used several adjectives to describe that "God-forsaken road": Frightening, alarming, hair-raising. I had heard about that harrowing trip when Nancy attended one of my memoir classes at the Dali Museum earlier this year. In the class I was helping Nancy and six other women launch "memoir blogs," sites where they could hone their memoir-writing skills. I urged them to pick a theme for the blog. Nancy wanted to write about her experiences indulging in risky travel late in life. She told us about one of the days on that "highway" when she and Susan were turned back by armed soldiers who warned them that they were riding into a war zone. "Risk doesn't have the same meaning when you're in your eighties," she told the roomful of stunned women in their sixties and seventies. "Wouldn't you rather go out in a blaze of glory rather than die in a nursing home? Think of what stories your grandchildren would have to tell about you!" Now I am sitting with Nancy and Susan in Nancy's living room overlooking the glistening waters of Tampa Bay. A map of the United States is spread across the dining room table. On a large calendar, the women have blocked out their upcoming Christmas Card List Road Trip. They have already taken a practice run down to see Christmas card friends in Naples, Florida, including a friend of Nancy's from kindergarten days. During this practice lap, they would also be traveling north of St. Petersburg to Tarpon Springs. Susan was excited to check out some Greek food and the sponge docks. In April the two plan to take a three-week excursion through the Southwest and up into the Central States in Susan's car. In June they'll meet back in St. Petersburg and head north up in Nancy's car and go up through New England. In August, it will be Sue's turn to drive again, this time across the Northwest and up to Vancouver. Then they'll finish up in October with another sweep through the Northeast in Nancy's car. Each have about 40 people on their list, with few overlaps between them. They plan to stay only one day with each Christmas card lister. When they call their friends to tell them that they are coming -- thanks to Susan, everything is scheduled, including exact arrival and departure times -- they ask them if they can recommend a nearby B&B. Most have invited them to stay in their homes. Some have urged them to stay longer than a day, but the women are adamant. They are on a strict schedule. These 80-somethings have, after all, more than 80 people to visit in 80 days or so and they aren't getting any younger. They have though agreed to give me updates on their road trip. So watch this space for the Next Chapter of The Christmas Card Road Trip: The All-True Travels and Adventures of Nancy and Susan.